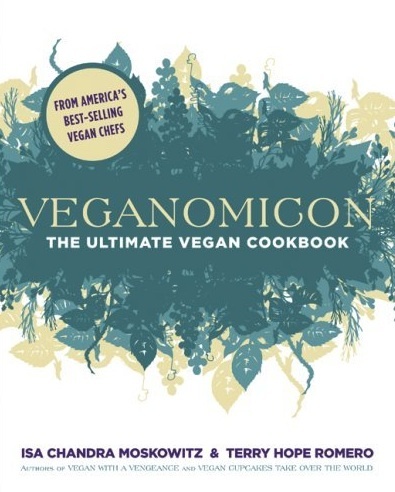 Veganomicon includes more than 250 of our favoritest vegan recipes with absolutely no "soy cheese" this or "store bought veggie burgers" that. Many of the recipes were written for everyday meals, in hopes that you won't even need to look at the recipe after making it a few times; the kind of chow you can whip up any night of the week with your pantry staples and some seasonal produce. But you can also trust it when you're looking for an extravagant spread to impress, say, your in-laws, or the mayor of your town when she stops by. During the course of developing recipes, we kept coming back to this phrase: Recipes you wish you'd grown up with. These aren't necessarily restaurant masterpieces, although we bet many of the recipes will rival the $26 entrée at many vegan eateries. It's real and honest home cooking, with a splash of panache that only two food-obsessed chicks could arrive at. These recipes were not born from airy-fairy, spotless, brushed, stainless-steel, made-for-TV kitchens. The recipes that await you in the deepest, darkest inner sanctum of this book were created by two women who cook, live, and eat in real urban kitchens. This is food made while chatting with significant others, gossiping with friends, and shooing nosy pets off the countertops. In other words, this is kind of food you make and eat while life happens.